CarCharging Group Expands. CarCharging, a nationwide provider part of the Car Charging Group, Inc. is continuing its electric vehicle (EV) charging services with another strategic EV charging service location, the Harbor Bay Business Park in Alameda, California through its partnership with Broadway Management. Why is this important? As more businesses, hotels and restaurants hail to the world: “We are here and we have charging stations!” This sends a comforting message to EV owners telling them it’s possible to drive away from homes for work, eat or sleep. In this case, the Harbor Bay Business Park is part of the master-planned Harbor Bay Isle development, which includes several hotels and restaurants. The EV charging services are provided in the parking lot of the Harbor Bay Business Park, located at 1151 Harbor Bay Parkway. What is at stake is allowing easy EV access on a 325 acre development that houses 100 companies dealing in technology research, development, support, software and hardware, professional sports, business services, engineering, telecommunications and biotechnology. 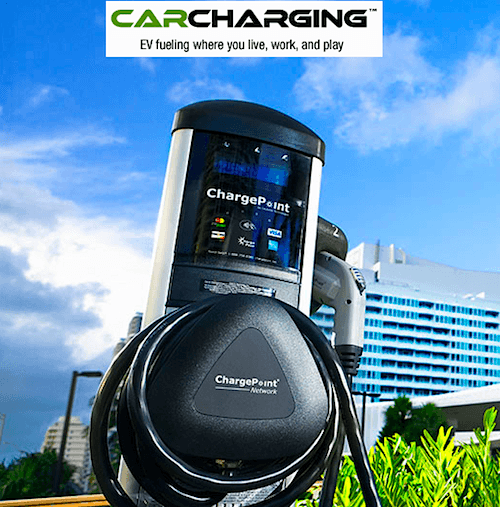 CarCharging & ChargePoint. CarCharging uses charging stations from ChargePoint which uses Level II, providing a quick 240 volts, 32 amps of quick recharge. EV drivers register and create a CarCharging account online and receive a small radio-frequency identification card (RFID) to be used for payments at any intelligent CarCharging station. The card allows drivers to use any charging locations on the ChargePoint Network. CarCharging App. Many of you might already know the CarCharging app that locates EV charging station locations and provides real-time charging station location information, as well as turn-by-turn directions. Soon drivers will soon be able to reserve a time slot, guaranteeing access to EV charging stations to recharge their electric vehicle, making it easier to recharge on the go. As the electric vehicle industry matures, we are starting to see hotels and restaurants installing charging stations and making very public. This sends out a message that EVs are practical and it is now possible to go eat while recharging, or simply stay at a hotel while your EV stays connected and recharged. CarCharging is strategically moving forward enabling as many EV drivers as possible a convenient and easy rechargeable life.